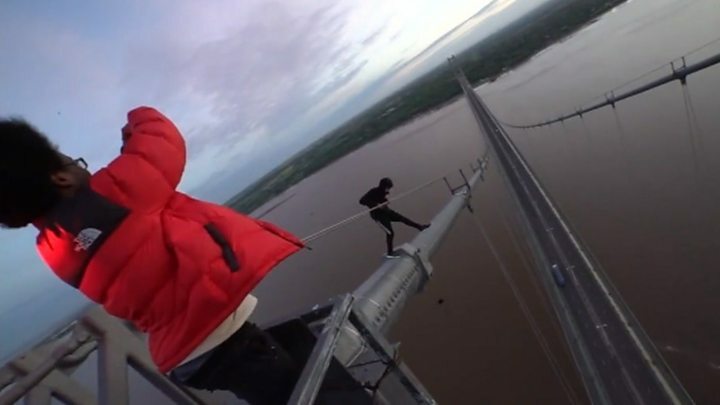 Security at the Humber Bridge is under review after "urban explorers" posted a video showing them scaling the structure without safety equipment. The young men scaled a barrier and then used suspension wires as handholds to climb to the top of the bridge, which is 156m (510 ft) high. Humberside Police and the Humber Bridge Board said they were working together to discuss security measures. One of those who took part denied the stunt was "irresponsible". Humberside Police have urged people not to take part in "such potentially hazardous activity". Charity Humber Rescue also condemned the group's actions. The climbers, led by London-based vlogger and urban explorer Harry Gallagher, who goes by the name of Night Scape, made the ascent on Monday before posting their antics on Youtube. The group are seen making a quick exit after CCTV cameras turned on them. Image caption The group's actions have been condemned as "extremely dangerous"
The footage, labelled 'Climbing the tallest bridge in England - Almost caught' has so far had more than 135,000 views. One of the climbers who appears in the video, Ryan Taylor, said he was "in control" throughout the climb. "We were up there taking our own photos and images and literally showing how beautiful the bridge is from a different perspective," he said. "We are professionals in what we do. "I am fully in control of my own life and whatever I decide to do is my own choice. I was in control of what I was doing." A spokesperson for the Humber Bridge said: "Although security at the cable access points is sufficient to stop the vast majority of people from gaining access, we are reviewing it." A police statement said: "We're aware of the incident in question and our security advisors are working with the Humber Bridge Board to discuss ongoing and future security measures. "From a safety perspective we'd recommend people do not put themselves at risk by taking part in such potentially hazardous activity." Humber Rescue founder Paul Berriff said he had helped recover 95 bodies from the stretch of water. "I know all too well what the consequences of being on the bridge can be. This is extremely dangerous and just putting one foot wrong would result in death."